This session took a closer look at the excavations of the ancient city of Ur in southern Iraq. In modern Arabic the site is called Tell el Muqayyar - 'the mound of pitch'. It gets this name from the amount of natural pitch or tar used by the ancient people of this area as a daily building material. It's about 10 miles west of modern Al-Nasiriyah. 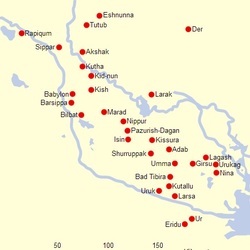 A large number of towns that emerged across Mesopotamia as the agricultural revolution gathered pace, and as metallurgy was discovered. This area became known as Sumer in ancient Akkadian, or Ki-En-Gir in the language of the first town-builders who lived there. The ancient Sumerian language is not related to any living language, and usually it is just simpler to use the later Akkadian descriptions. An important part of farming's success in this area was that people began digging irrigation channels and aqueduct tunnels ('qanats' in modern Arabic) at a very early date. The area between the Tigris and Euphrates was not rich in stone or large trees, but where there was enough water there would be lush reed beds. Consequently buildings were made mostly of mudbrick, reed bundles and reed matting. Most of the places marked on this map developed from small villages and were in continuous occupation and redevelopment until the common era. Excavation at the city of Ur was prompted by its associations with Christian and Jewish traditions. The environment around the site and its wider area has changed radically since the fourth millennium BC. Back in the time of its foundation the River Euphrates flowed around the site, which was effectively in a marshy meander of the river. The core of the settlement is believed to have been a small island in the meander of the river. However, prosperity meant that not only did settlers begin to build many mudbrick buildings, they also began heaping enormous amounts of refuse outside their settlement's perimeter, so creating a man-made 'Tell' or mound rising from the surrounding marsh. This video clip is a very informative 12-minutes and includes many photographs of the massive excavation in progress, as well as good descriptions of the discoveries. As well as excavating the temple or ziggurat in the centre of the ancient settlement, Woolley excavated the housing and a cemetery which proved to have a series of rich burials made between about 2600-2000 BC, that included many grave goods and evidence of human sacrifice on a substantial scale. Woolley's team used methods that were ground-breaking for their day, including using paraffin wax, plaster of Paris and bandages to stabilised fragile evidence in situ before shipping whole blocks of stratigraphy back to laboratories for analysis.